The No. 1 Car Spotter: Best in the Village - Maybe in the World! by Atinuke. A No. 1 Book. Review: How would you feel if you were able to know what kind of cars pass even before looking at them? The No. 1 Car Spotter: Best in the Village - Maybe in the World!, a No. 1 book by Atinuke is a great, quick read about family and caring for each other. Oluwalase Babatunde Benson (No.1 for short) is The No. 1 Car Spotter in the village, and maybe even the world. He lives in a small town in Africa with his huge family. There's Coca-Cola, Mama, grandmother, grandfather, Sunshine, Smile, Mama Coca-Cola, Beke, Bisi, Bola, Mama B, Auntie Fine-Fine, and much more! Meanwhile, No. 1's father is living in the city-- trying to make money for his loved ones. When the citizens of No.1's small little village find that their cart has broken, no one can get their fruits, vegetables, toys, and other goods to the market, so it's up to Coca-Cola and him to save the day! When the women of the family need someone to go buy them beauty products, No.1 isn't afraid to do it for them! And finally, when grandmother is ill, and Papa needs wheelbarrows in order to make money for her to go to the care center, No.1 will surely give away his wheelbarrow for the sake of grandmother's life. Follow No.1 in all of his adventures to try and make everyone in his family- including himself the best they can be. I rate The No. 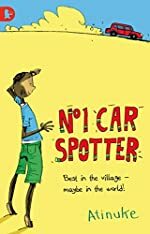 1 Car Spotter 5 out of 5 stars because I loved the way that Coca-Cola and No.1 are so dedicated to help their family and to make their village better. No.1 is definitely a great role model! He shows respect and helpfulness in many ways throughout the story. This book is a great, enjoyable read for all ages. So don't wait, go read The No. 1 Car Spotter now; you won't regret it! We would like to thank Kane Miller for providing a copy of The No. 1 Car Spotter: Best in the Village - Maybe in the World! for this review. Have you read The No. 1 Car Spotter: Best in the Village - Maybe in the World!? How would you rate it?